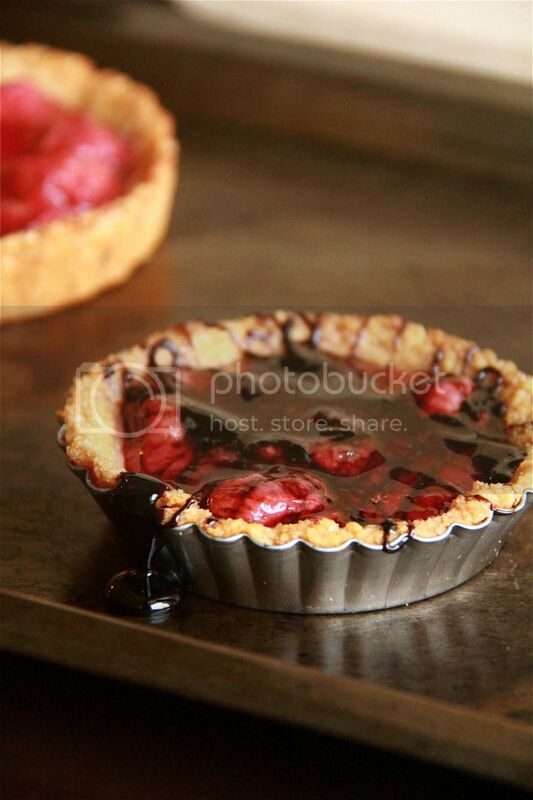 Crumbs and Cookies: fresh strawberry tart with balsamic drizzle. fresh strawberry tart with balsamic drizzle. I usually don't go for fruity desserts because they seem too healthy. Desserts should be an indulgence- rich, creamy and downright sinful. Somehow though, I just couldn't avert my eyes away from the screen when I saw a picture of a fresh strawberry pie on a blog not too long ago. I had some strawberries in the freezer- and this tart was born. The strawberry filling was scrumptious, to say the least. It was sweet and refreshing, and I couldn't stop spooning it in. I even managed to convince myself that because it was primarily fruit, it had tons of vitamins and I had every reason to stuff myself with it! Oh yes the almond tart crust? The kitchen smelled wonderful while it was baking. Please bear in mind though that it is a bit more crumbly than your usual crusts and more prone to moisture. I scaled the quantities of each component down to make one 4 inch tart and one 3 inch tart but I shall give the full original quantities here. This makes enough for a 9 inch pie crust so there should be more than enough for a 9 inch tart crust. I adapted this recipe slightly from Hungry Rabbit, omitting the lemon zest and adding ground cinnamon instead. The great thing about this dough is that it's gluten-free, so more people can join in the sharing and there's close to zero chance that you will overwork the dough. The not so good thing is that because there's very little butter in the dough, it won't release very easily from the pan after baking like normal crusts do. Hence, it is essential that you butter your pan before using. Add all the ingredients except the butter and egg in a food processor and pulse until just combined. Add the butter and pulse until a sandy crumbly mixture is formed. Add the egg and pulse until just fully incorporated and until a dough is formed. Pat the dough into a lightly buttered or oiled tart pan, use a fork to poke some holes in the crust and chill for at least an hour. Preheat oven to 350F. Bake for 20 to 30 minutes, or until the crust is browned and fragrant. Make sure to check on the crust halfway through the baking time to see if it's browning too quickly. If it is, cover loosely with aluminum foil. If the crust is puffing up, tamp it down with the back of a spoon. For smaller tarts, 10 to 15 minutes should do the trick. Allow the crust to cool in the pan for 10 minutes before unmolding it onto a wire rack. Let the crust cool completely before filling. Chop half of the strawberries finely in a food processor or by hand. Place the chopped berries in a saucepan and cook over medium heat until their juices are released and bubbling. Mix the sugar and cornstarch together in a small bowl and add into the saucepan. Add the lemon juice as well and cook on low heat until the mixture thickens. Remove from heat. Slice the remaining strawberries into halves if they are large. Leave smaller ones whole if you wish. Mix them into the cooked strawberry mixture. 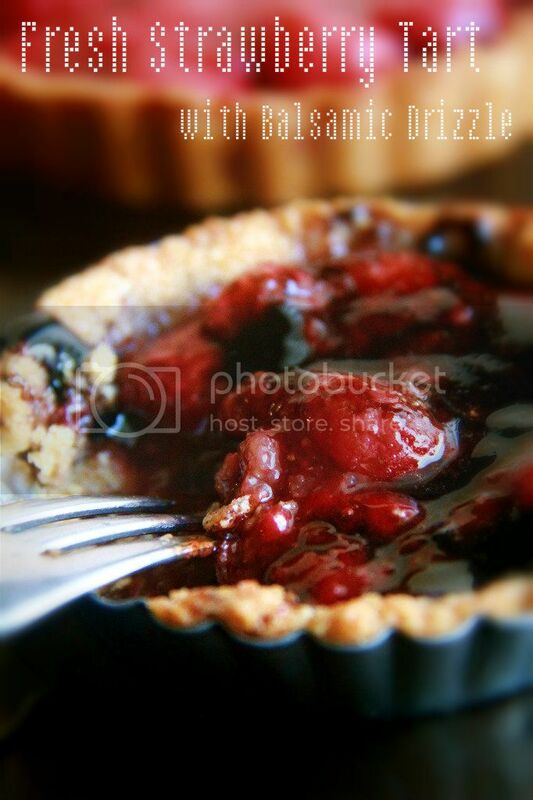 Pour the entire mixture into a bowl to cool before filling the tart. Heat the balsamic vinegar and brown sugar in a small saucepan until it comes to a boil. 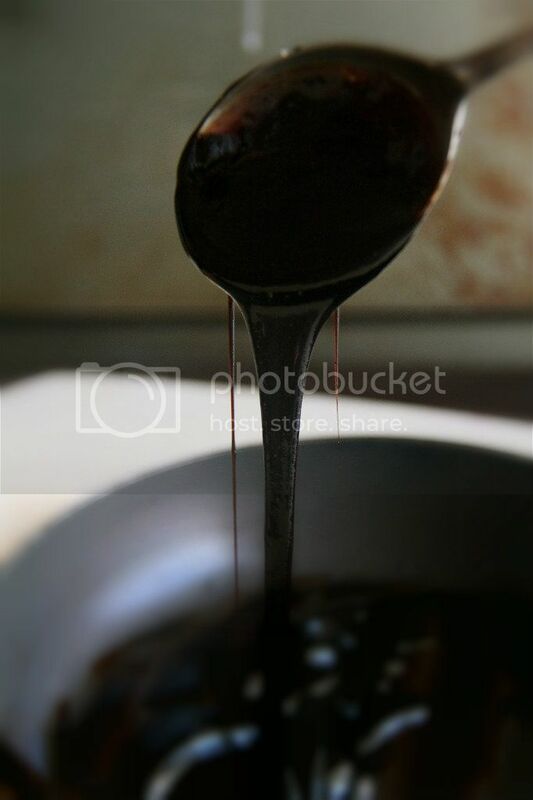 Let it reduce until syrupy (when about 2 tbsp left)- the balsamic should cling to the back of your spoon. Be careful not to reduce it too much though! It will continue to thicken off the heat. 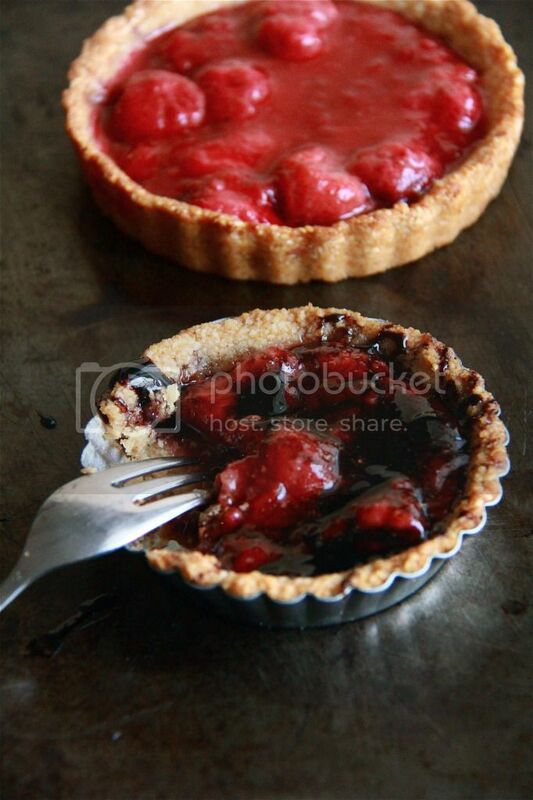 Fill the tart with the strawberry mixture and chill until completely cold, about 2 hours. Drizzle with the balsamic reduction. 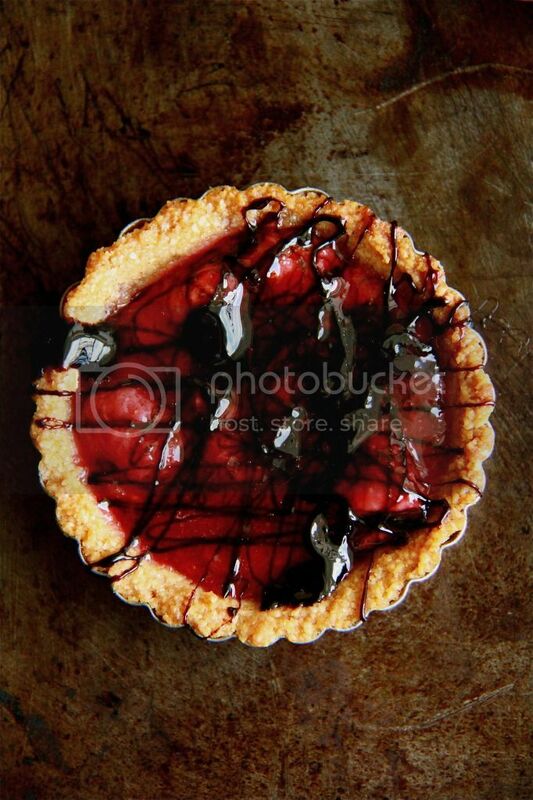 Try brushing a tiny bit of melted chocolate on the crust before adding the filling. That way, the filling doesn't make the crust soggy. The balsamic drizzle is a darling. Balance the sweet and fruity flavors. You are a genius! tea cupcakes with condensed milk icing. checkerboard vanilla cake with ganache frosting. crunchy-top chocolate chip muffins take 2.
a pastel swirl birthday cake.